Swimtastic Swim School offers swim camps during the summer semester, where children come every day for two weeks. Select swim camps are available for one week periods. 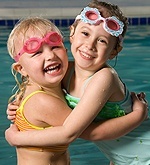 Summer swim camps provide consistent and focused teaching while having fun. Children make excellent progress with their swim skills, preparing them for that summer vacation and fitting into your busy summer schedule at the same time. Camps run throughout the entire summer and are ideal for the student looking to increase swim skill progression. Daily swim lessons allow for faster growth and development through consistency and repetition. For the true over-achiever, doubling swim camps with regular weekly lessons provides for even faster progression rates. After all, practice makes perfect. To enroll in an upcoming swim camp, register online in real-time or call (888) 549-SWIM (7946). Our swim lesson questionnaire will automatically determine your student's perfect class level as well as present you with current pricing and real-time registration options. Click or call to secure your favorite time-slot today!